The hardy Blue Panchax is one of the oldest Killifish to be kept by aquarists, a favorite in the hobby since the beginning of the 20th century! The lively Blue Panchax Aplocheilus panchax is one of the best known and most popular of the killifish species. This is because they are inexpensive, colorful and hardy. What more could you want in an aquarium fish? They can be kept in a community setting with moderately peaceful fish of the same size or larger, though they may snack on smaller species. If you plan on keeping more than one, they need a fairly large aquarium (at least 20 gallons) as the males can get quarrelsome. The Blue Panchax Killifish comes from a large area in Southeast Asia and because of this large distribution, it comes in many different color schemes. The basic coloration is an iridescent blue body with a black spot on the dorsal fin. Some races will have varying amounts of red or orange on some of the fins. The body coloration may include small spots of yellow, green, red or orange. One of the most popular varieties, the Orangetail Killifish seen in the picture above is from India and has a bright orange tail. There are simply tons of common names this species is called and some of them are common names used for other killifish species as well. Just a few of them are Blue eye Killifish, Java Medaka, Spotted Medaka, Spotted Ricefish, Blue eye Killi, Lead head Killifish, White Spot Killi, and Silver Head Killifish. Then there are common names for color varieties, like the Orangetail Killifish discussed above. 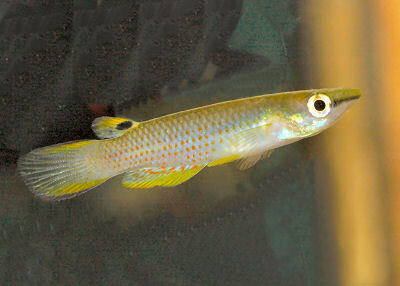 The Blue Panchax Killifish Aplocheilus panchax was described by Hamilton in 1822. They are found in Pakistan, India, Bangladesh, Myanmar, Malaysia, Indonesia, Nepal, Cambodia, Viet Nam and Sri Lanka. Other common names they are known by include Spotted Medaka, Orangetail Killifish, Blue Eye Killifish, Blue Panchax, and Spotted Ricefish. This fish is not listed on the IUCN red list. The Blue Panchax are generally found in ponds, fields, and canals; inhabiting clear water areas that containing large amounts of vegetation or among the roots of mangrove trees. These highly adaptable fish have also been found in a couple hot springs in Singapore, and they are even found in hypersaline waters. Their habitat has been expanded due to their introduction to different areas to aid in controlling mosquito populations by feeding on their larvae. In the wild, insects and larvae are the main food for these fish. The body of the Blue Panchax Killifish is slender and elongated, the dorsal fin is set far towards the back half of the body, and the scales are round. The head is flattened on top with a pointy snout and upturned mouth, they have no barbels. The basic coloration is an iridescent blue body with a black spot on the dorsal fin. Some races will have varying amounts of red or orange on some of the fins. The body coloration may include small spots of yellow, green, red or orange. One of the most popular varieties, the Orangetail Killifish from India, has a bright orange tail, as seen in the photo above. This is a hardy fish that is fairly easy to keep. It can tolerate many different aquatic environments. They are not a very large fish so a big tank is not needed. The Blue Panchax Killifish primarily carnivores. They will eat most floating prepared foods that are small enough to fit in its mouth and will greedily accept frozen bloodworms and brine shrimp. The Blue panchax is a very easy fish to care for because they survive in such varied environments in the wild. A good quality filter will make maintenance very easy for this fish. Weekly water changes will help keep the fish healthy and happy. Do regular weekly water changes of 30%. The Blue panchax will spend most of their time near the top of the aquarium. This is a very hardy fish that is easy to keep. A tank size of 20 gallons or larger is recommended if you plan on having more than one of this species in your tank. As with many fish, the lampeyes will do best and are most effectively displayed in tanks which simulate their natural habitat. 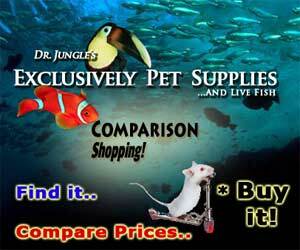 A well lit planted aquarium with a dark substrate will showcase this fish best. Provide good filtration and do regular water changes. A tight fitting lid is a necessity because this is a fish that likes to jump.ump. Water Region: Top - Panchax Killifish will spend most of their time near the top of the aquarium. The Blue Panchax Killifish are generally peaceful towards other varieties of fish but will sometimes quarrel amongst themselves. Usually this fighting will not cause any damage. They are best kept with other moderately peaceful fish of similar size or larger. The males and females of this species look very similar so sexing can be difficult. Males are sometimes a bit darker in color. The Blue Panchax is an egg layer that is relatively easy to breed. A healthy pair may lay 130-300 eggs daily for several weeks. They will generally spawn among fine-leafed plants, Java Moss, or a clean spawning mop. It is relatively easy to remove the spawning substrate containing eggs, and replace it. The plants/mop should be removed daily and replaced with new ones. The egg laden plants/mop should be placed in a tank containing clean water with the same quality parameters as the parent's tank. The eggs hatch after 11-15 days. After the eggs hatch, the fry will have an obvious egg sac on their bellies. The fry can be fed nauplii and powdered dry foods after their eggs sacs have been absorbed. Some of the fry will grow faster than others so there is the possibility of cannibalism. If you want to successfully raise as many of the fry as possible, you will have to sort them by size so this doesn't happen. Pay close attention when feeding, as foods if uneaten can quickly foul the water. Blue Panchax are extremely hardy and disease is not usually a problem in a well maintained aquarium. That being said there is no guarantee that you won't have to deal with health problems or disease. They are primarily susceptible to velvet and bacterial infections if good water quality is not maintained. A good thing about Blue Panchax Killifish is that due to their resilience, an outbreak of disease can often be limited to just one or a few fishes if you deal with it at an early stage. When keeping more sensitive types of fish, it is common for all fishes to be infected even before the first warning signs can be noticed. The best way to proactively prevent disease is to give your Blue Panchax the proper environment and give them a well balanced diet. The closer to their natural habitat the less stress the fish will have, making them healthier and happy. A stressed fish is more likely to acquire disease. The Blue Panchax Killifish are readily available and are moderately priced.